In years past, Jeremy has gone completely overboard with his Mother's Day Breakfast creations. Click here to see my "plate" from last year. While his intentions are great, (he just wants to spoil me and give me love through food - which I totally get - we are food people) I simply could never eat ALL THAT FOOD! I requested one entree for breakfast this year - STRAWBERRY SHORTCAKE. For breakfast. I was shocked at his self restraint. He made only strawberry shortcake and cinnamon rolls. It was the best Mother's Day breakfast ever (besides the video taping the whole thing - there wasn't an ounce of make-up on my face and my hair was soaked from my shower 2 minutes before). Check it out - it was on a real plate this time! Fresh strawberries, chocolate syrup and chocolate shavings for garnish. What a guy to remember the presentation. And there were 2 beautiful roses to boot. Gorgeous! The kids presented their homemade cards and there were more roses waiting downstairs. My toes were beautified the day before at my Mother's Day pedicure. Aren't they so lovely? Lizzie was proud of her Mother's Day gifts we made at Joy School a few days before. We made homemade freezer jam from Robb's home grown Green Gage Plums. Yes, GREEN JAM. It is quite tasty and all the moms and grammas loved getting a homemade treat from Lizzie. Thanks to my family and sweet husband for a fabulous Mother's Day. I felt so loved and special. Wow! I got a great breakfast too, and as always I shared it, this year with Peyton. Happy Mother's Day! Your toes look great too. 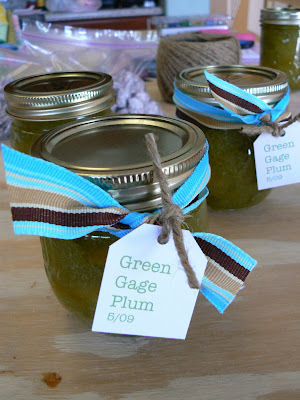 green gage plums are my favorite. i had no idea they existed anywhere else but in france!!! here they are called "reine claude" meaning the good queen claude from the 1500's. how's that for a little history for your joy school students!